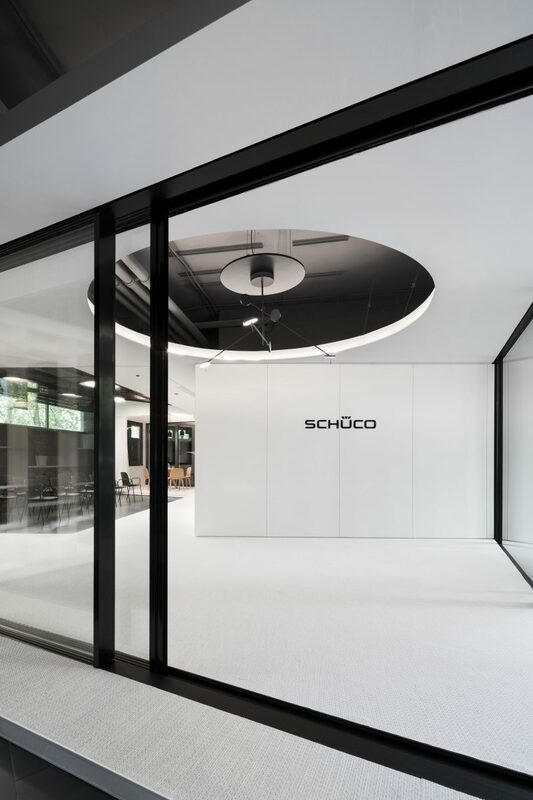 The origin of our project for the Schüco showroom interior was launched, when we won the two-stage competition with a dynamic proposal, working with disposition and form of fragmented masses, interlinked into one envelopping structure and deployed into a strictly delimited space on the ground floor of a polyfunctional building in the city of Bratislava. 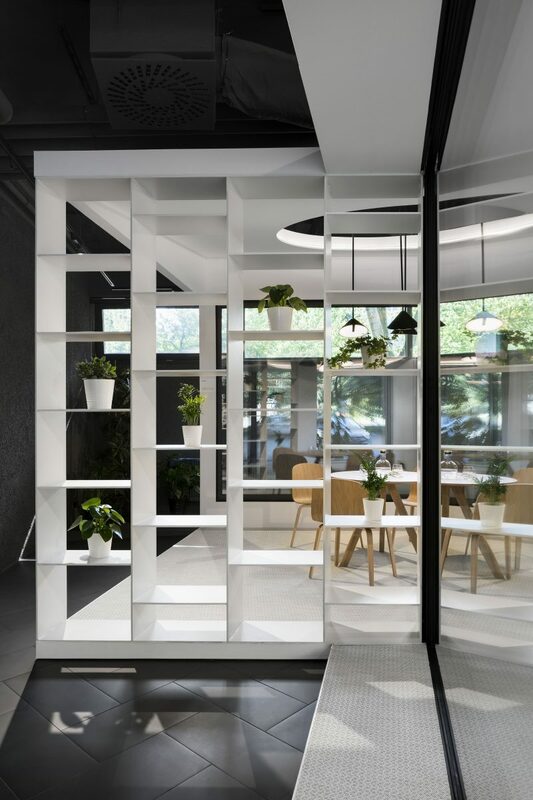 Our concept relies on the contrast between the rough exterior surroundings and a clean interior „shell“; in other words, the house and the garden. 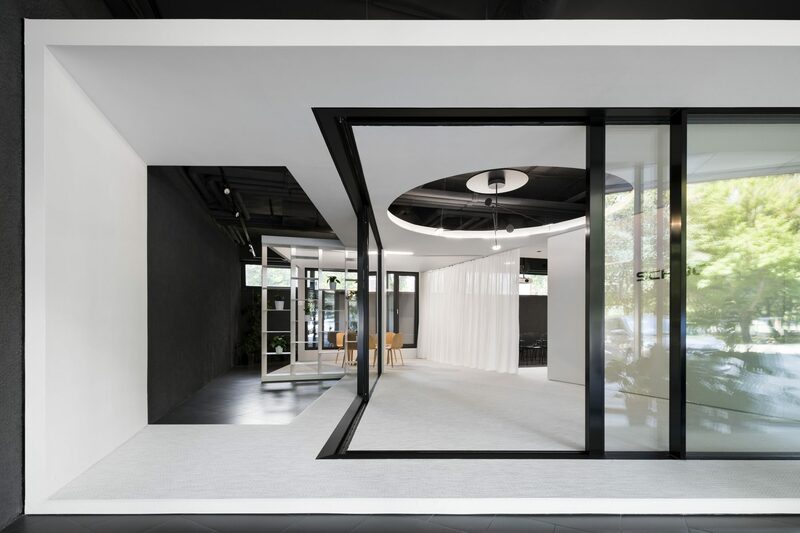 In our project, we tried to further develop this trivial contrast by continually forming, opening up and dynamizing the initial cubic enclosed masses. 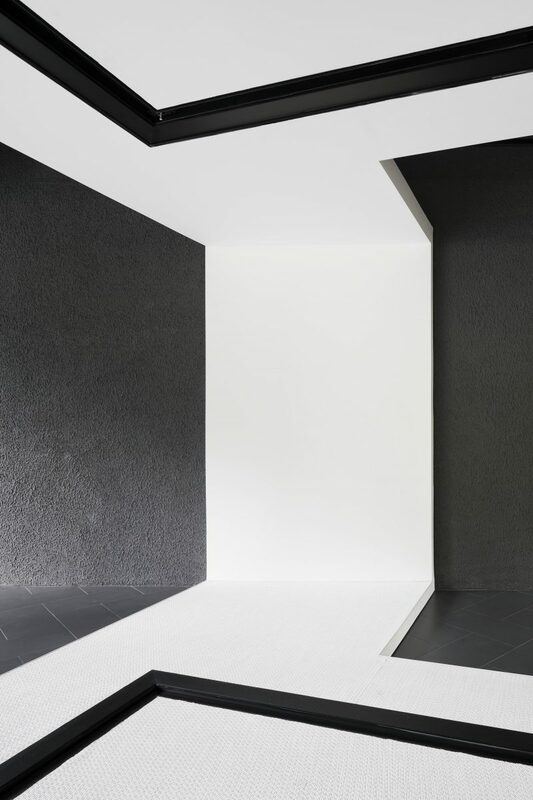 Our concept enhances contrasting colour and material of the interior white „shell“, a fragment of the house, inserted into the bleak and dark surroundings formed by rough plasters on the walls and ceramic tiles on the floors, which are more often characteristics of the exterior. 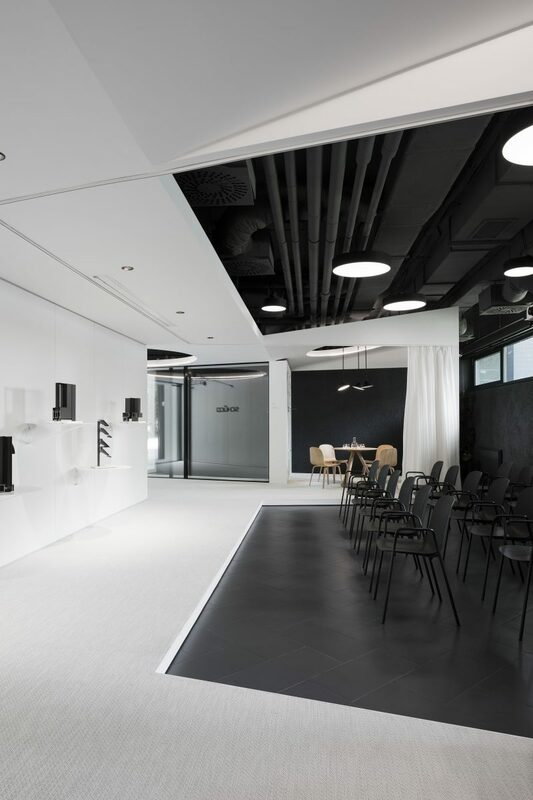 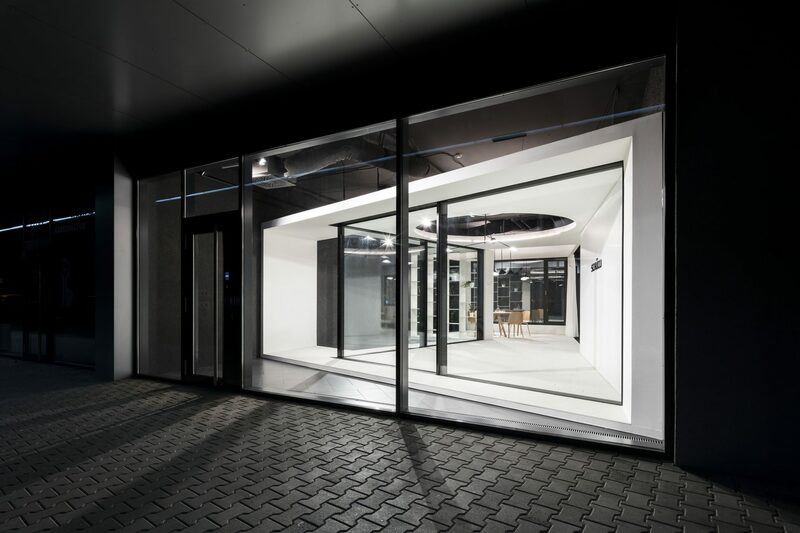 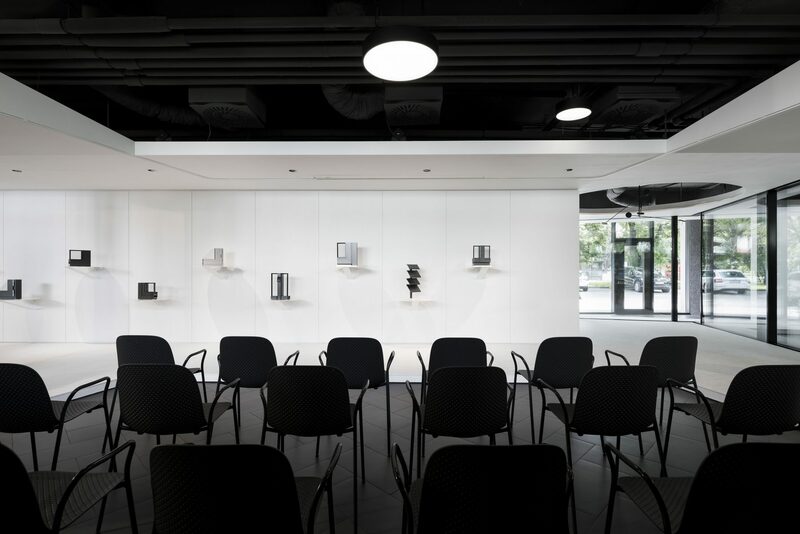 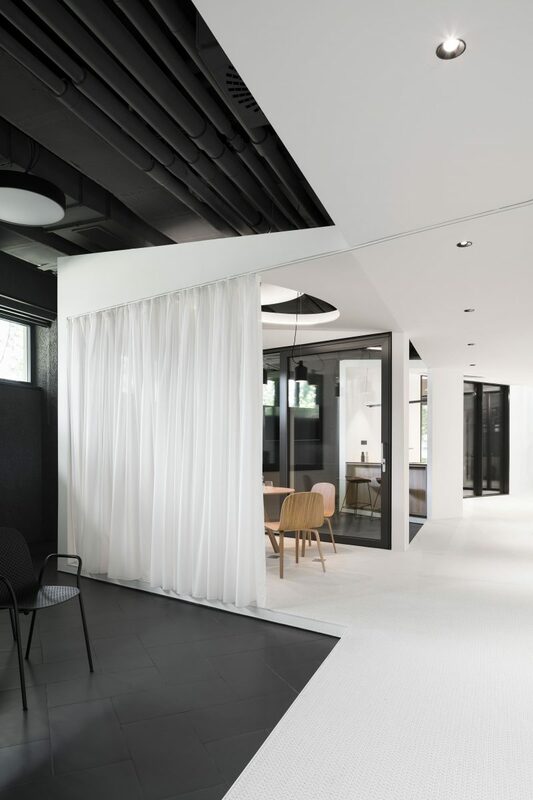 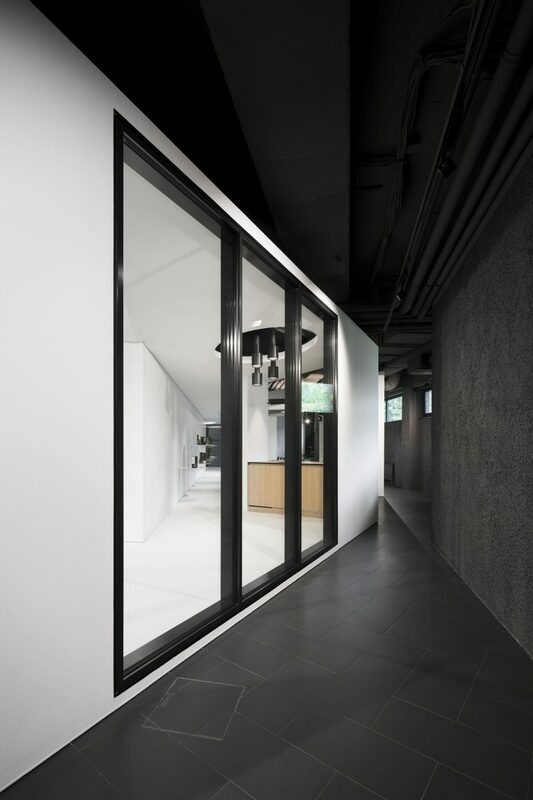 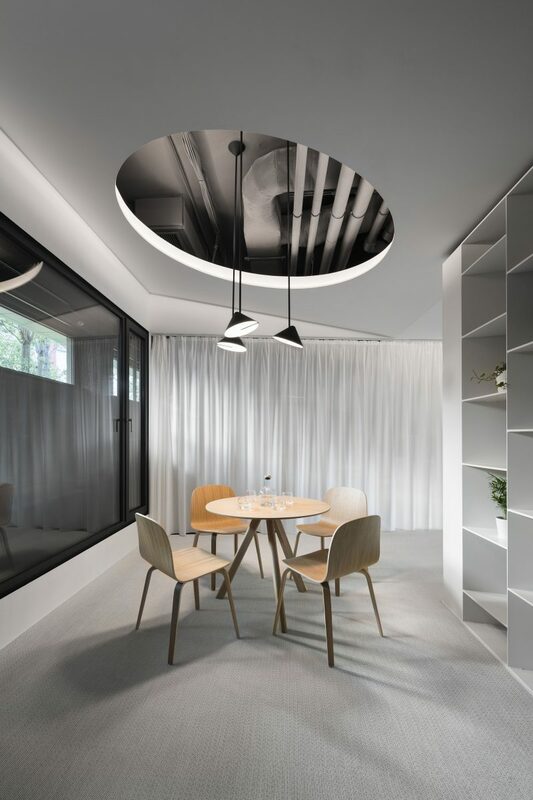 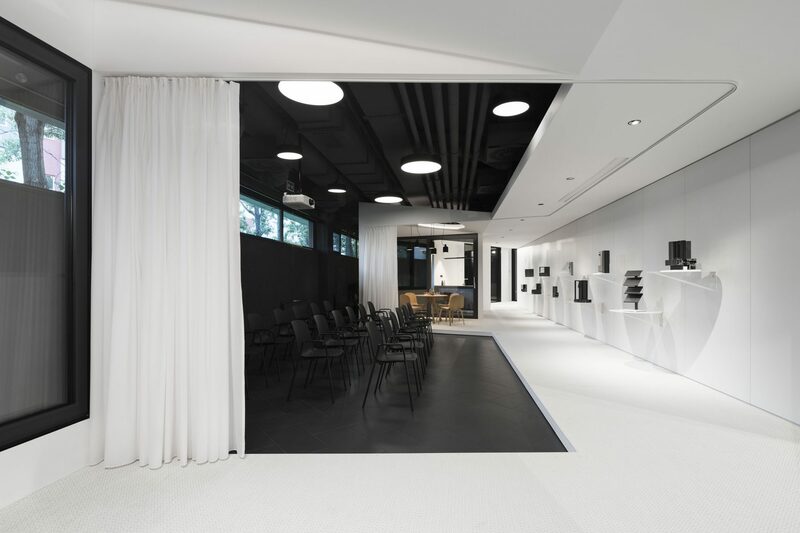 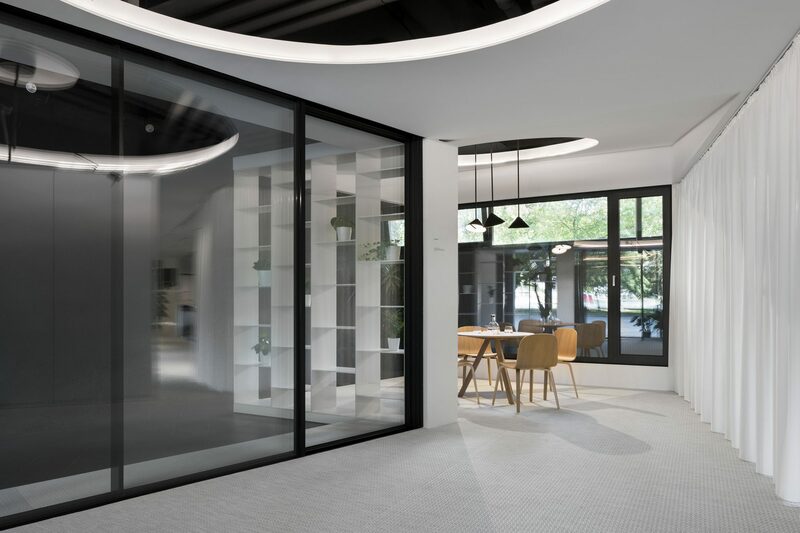 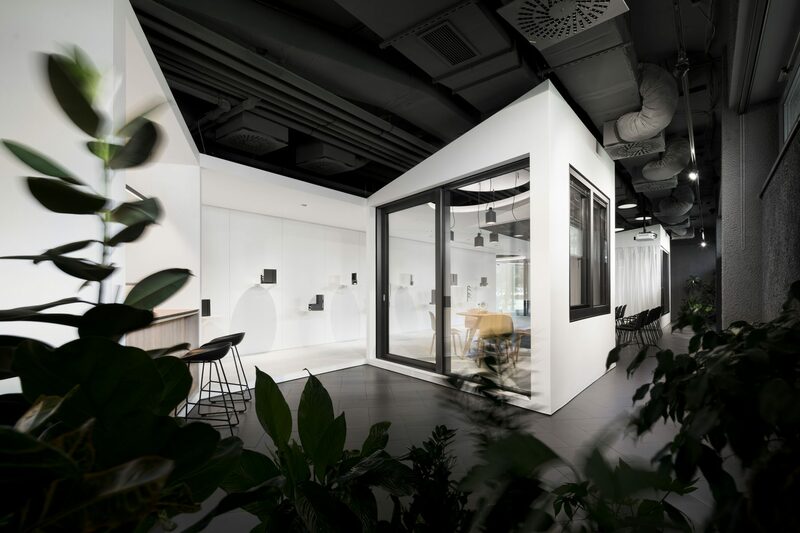 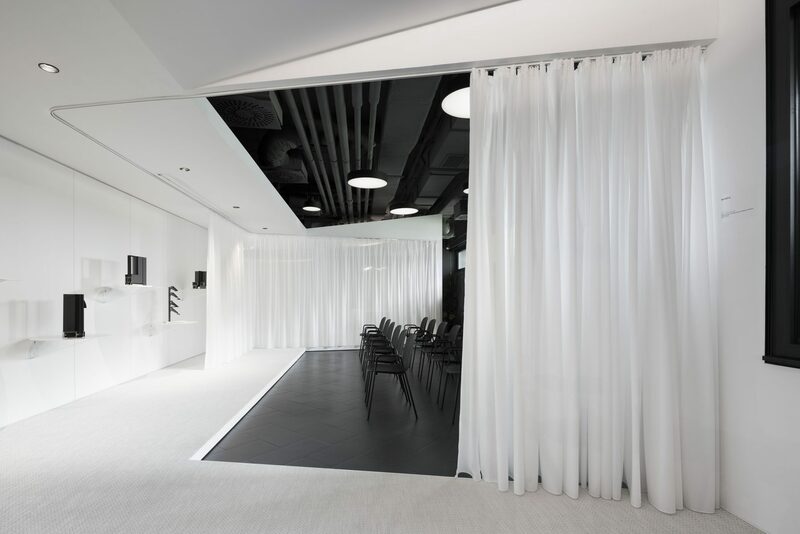 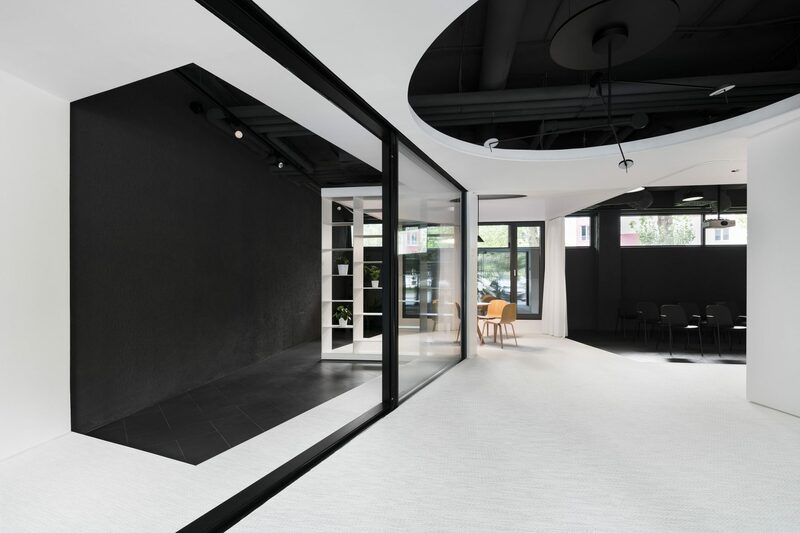 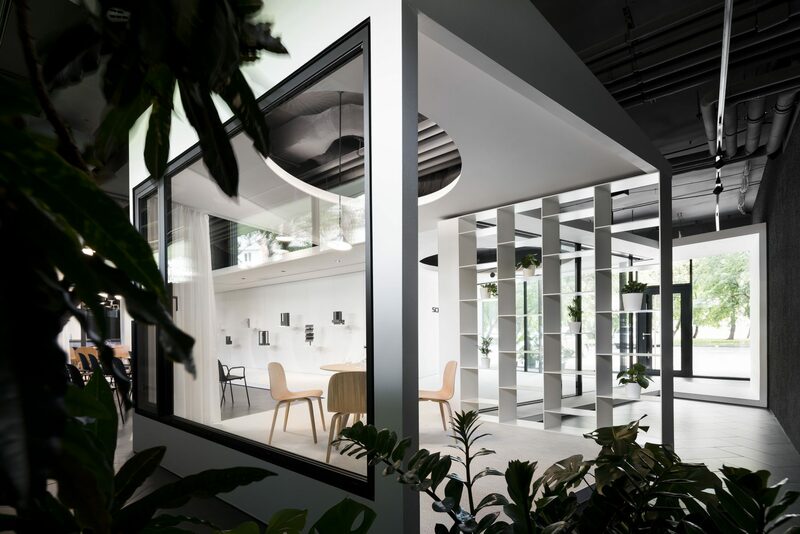 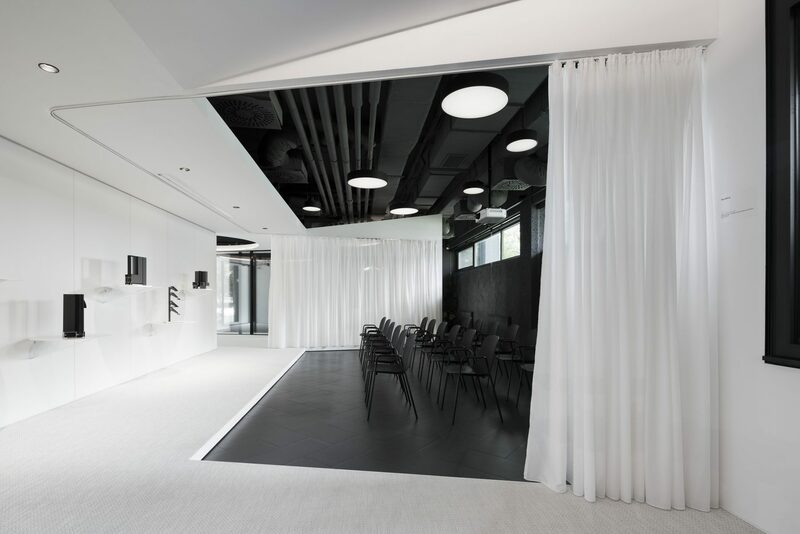 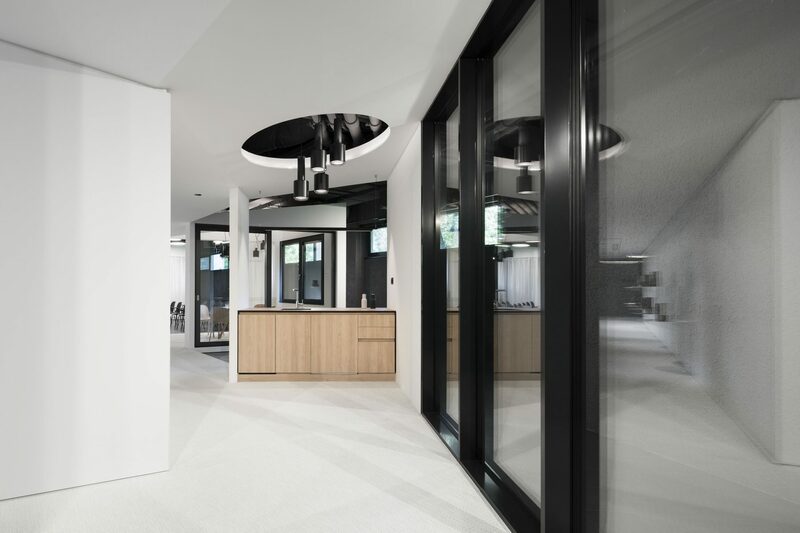 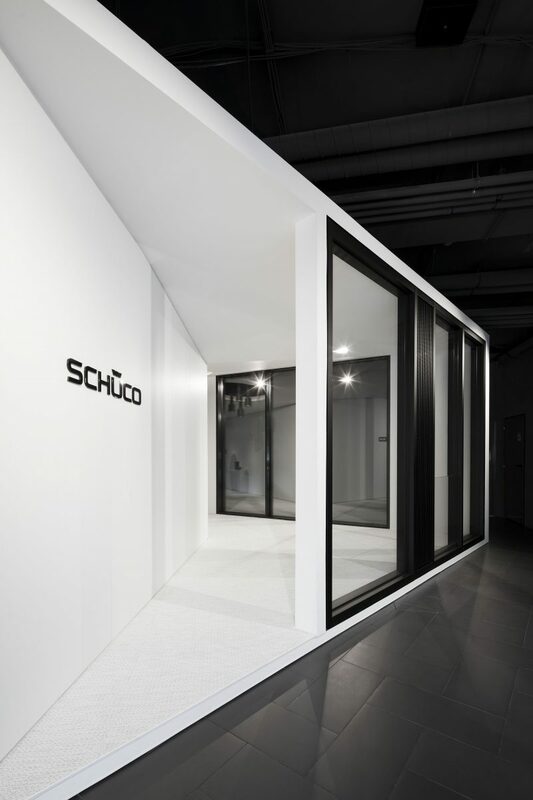 Into the walls of the embedded white structure we have integrated the essential element of the showroom – functional real-size windows by Schüco in various sizes and styles. 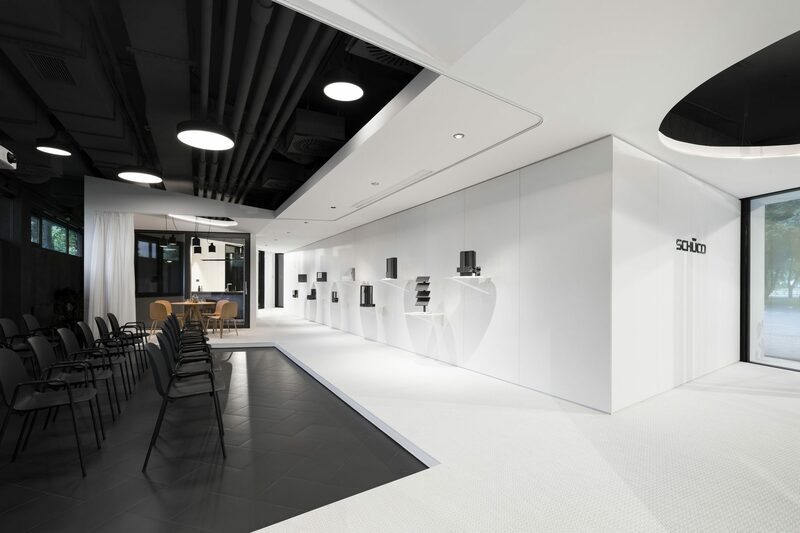 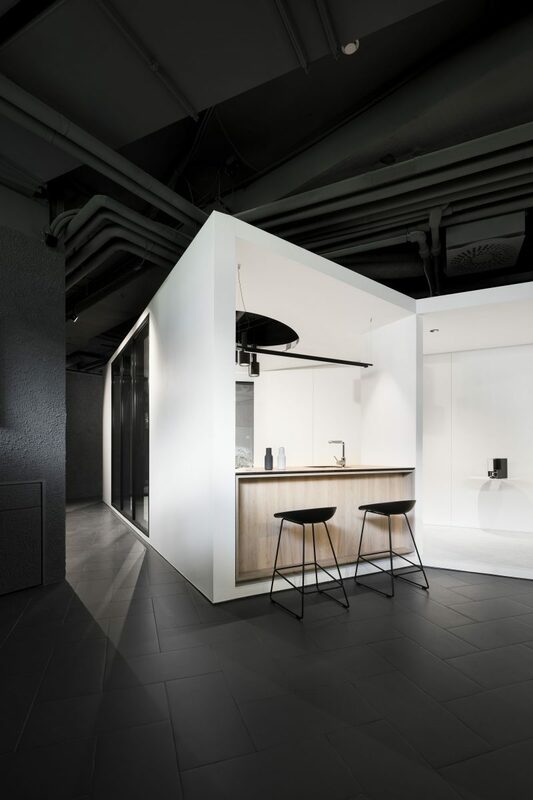 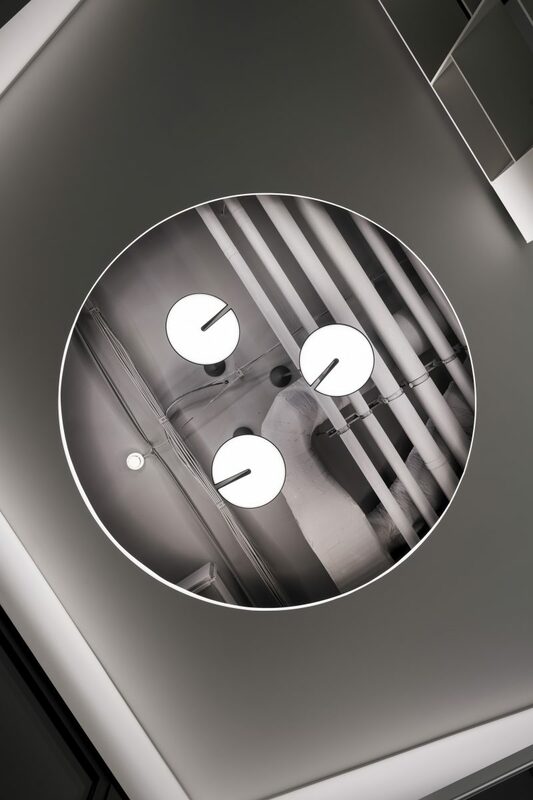 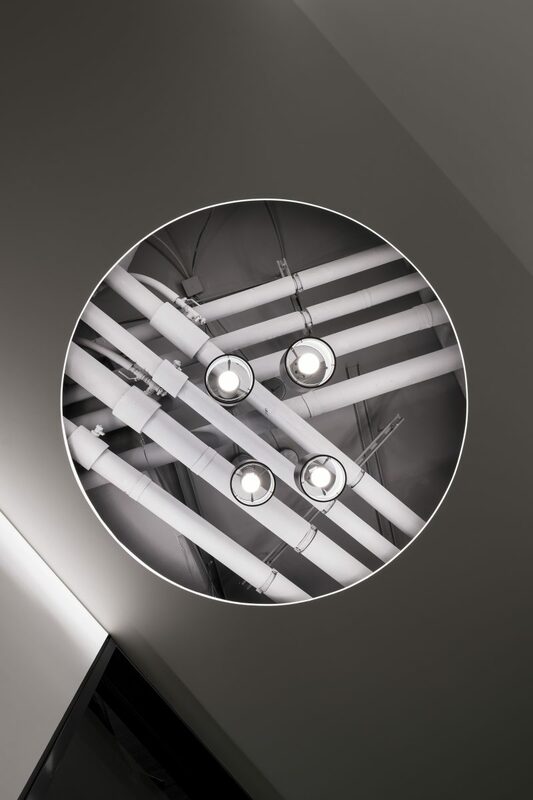 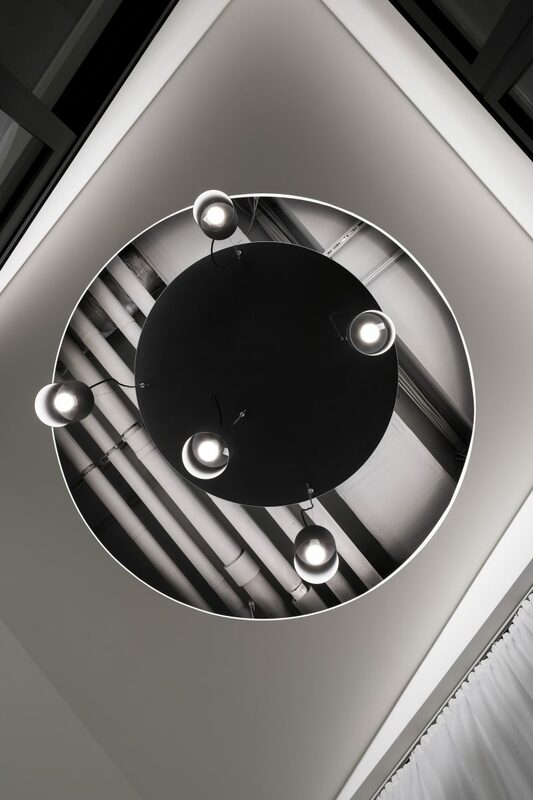 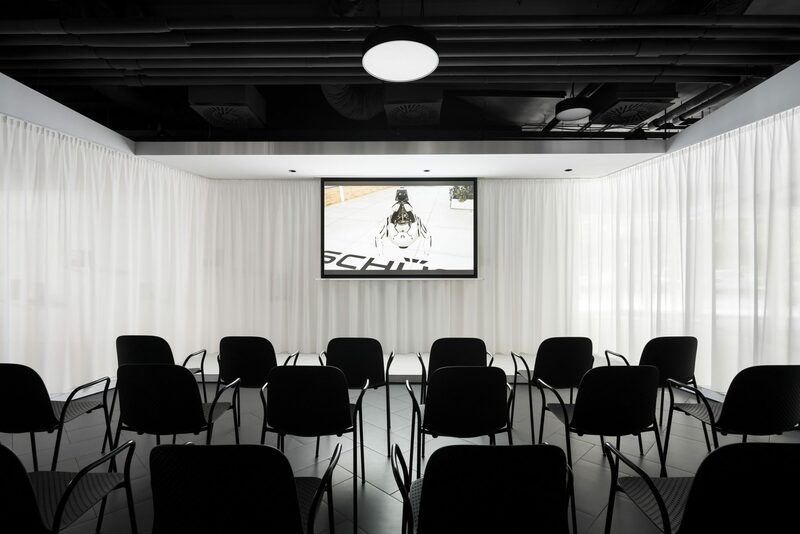 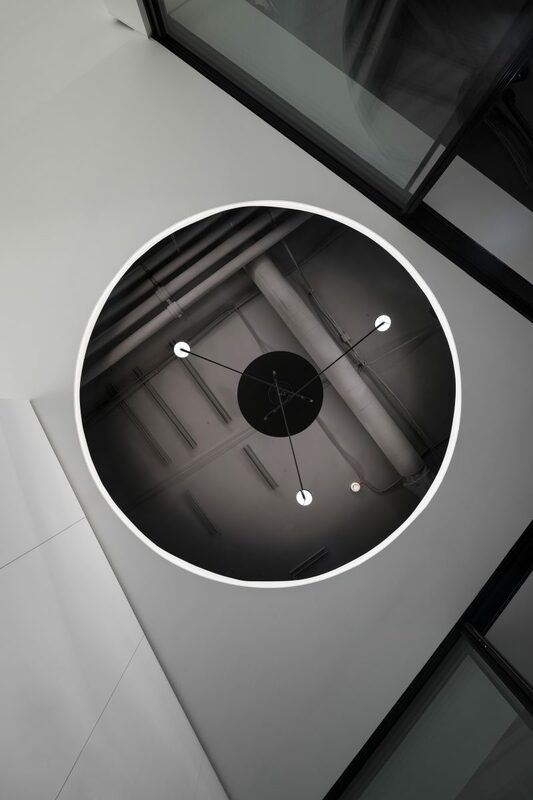 A visitor to the showroom is invited to try them out, walk through them and perceive them in a real-life environment. 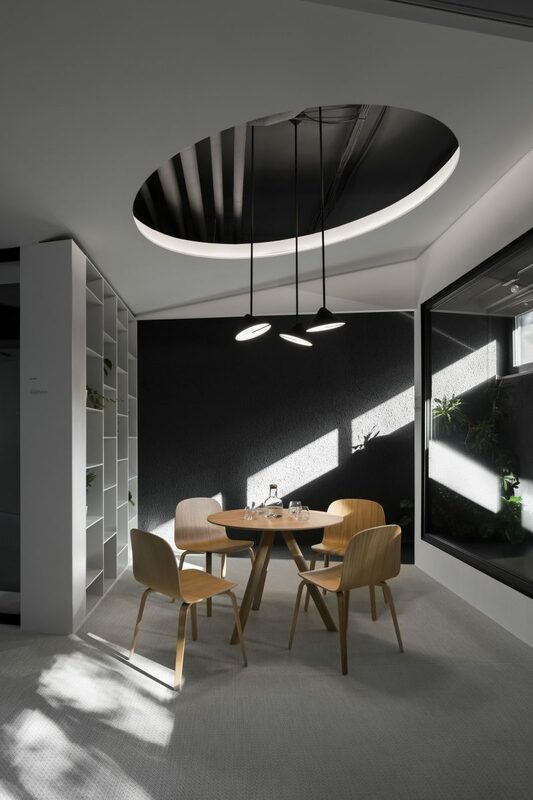 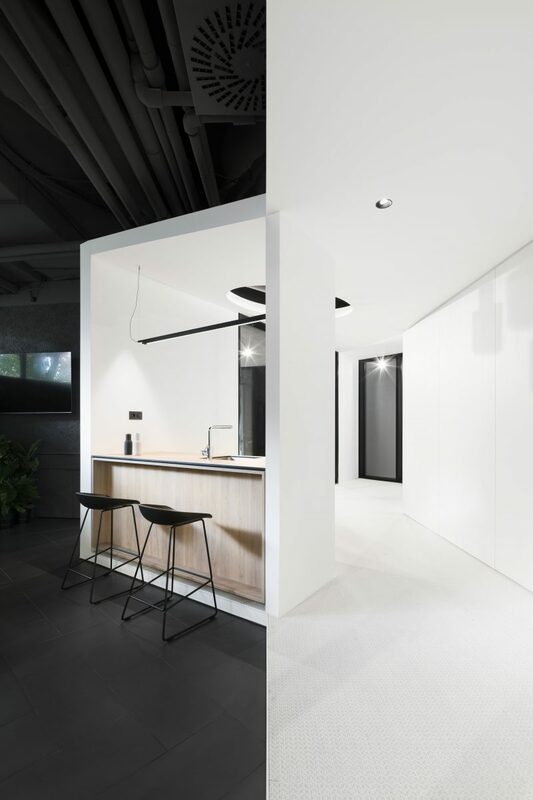 These windows, however, are not only on display, but are also functional and aesthetic components delimiting spaces such as intimate meeting rooms, a small kitchen with a kitchen island, and a lecture „patio“. 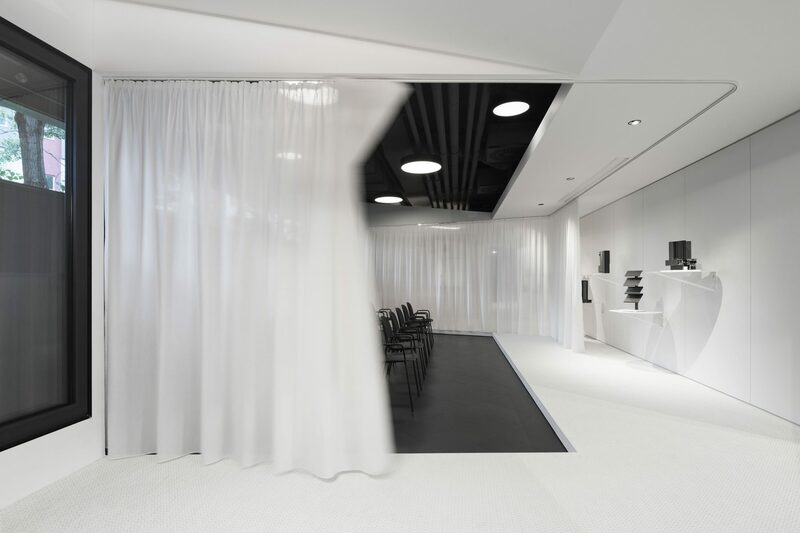 The interior of the showroom entwines a logical pathway, which, however, doesn´t have to be strictly followed. 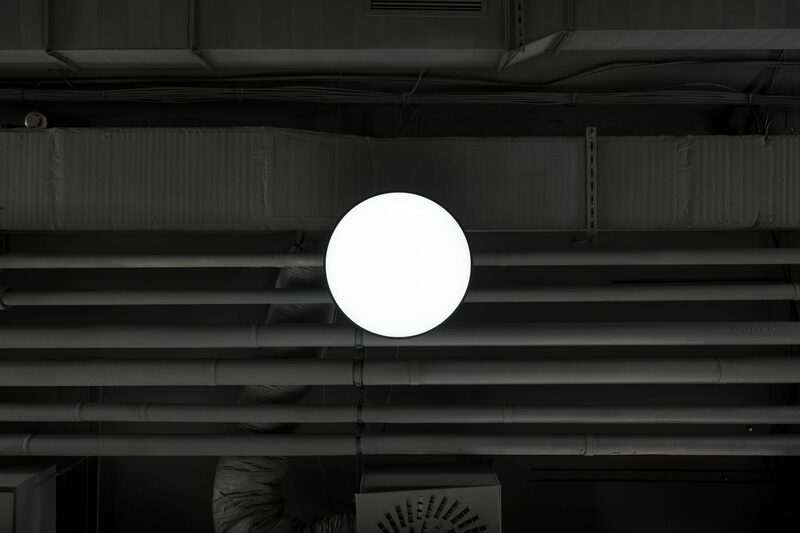 The visitor can pass freely through the perforated white „shell“ into the dark surroundings and back again. 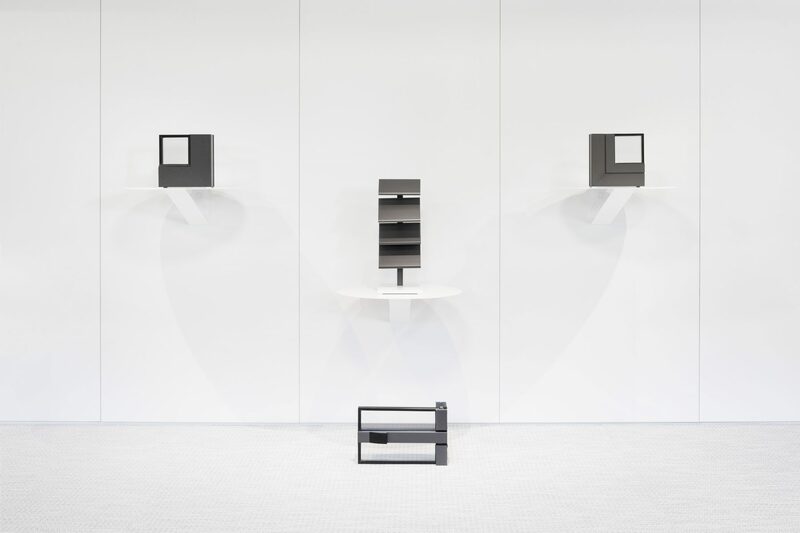 During his/her „journey“, the visitor perceives a steel load-bearing bookcase, a large sliding corner window with an electric drive, more intimate spaces for private meetings furnished with oak accentuated mobiliari, a „patio“ used for lectures and projections, separable by drapery, a kitchen with bar seating, and a space offering immersion into virtual reality. 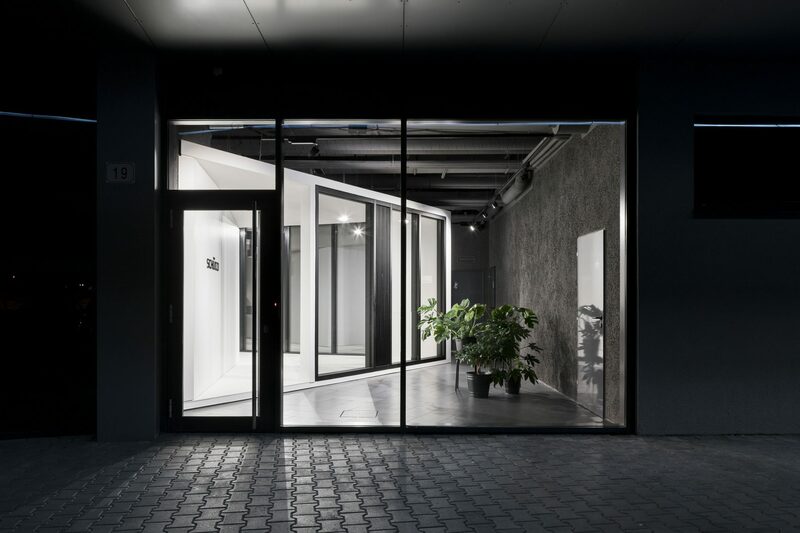 Surrounding dark space of the inserted structure is complemented by freely distributed greenery, which softens and underlines its exterior character.